This is a plantation desk made out of walnut, secondary wood is white pine. The top of the table is two wide boards of walnut. The top had been nailed on. This caused the top to crack and split at the glue joint. I repaired this and reattached the top so it could float to allow for expansion and contraction. The drawers and runners were badly worn. I resoled the drawers and replaced the drawer runners. The finish was gone. I put a new finish on of shellac. The writing surface is the original oil cloth and is in very good condition. This would date from1830-1840. Dimensions : height 57″ : with 39″; depth 24 3/4″.The price is $1,700.00 . 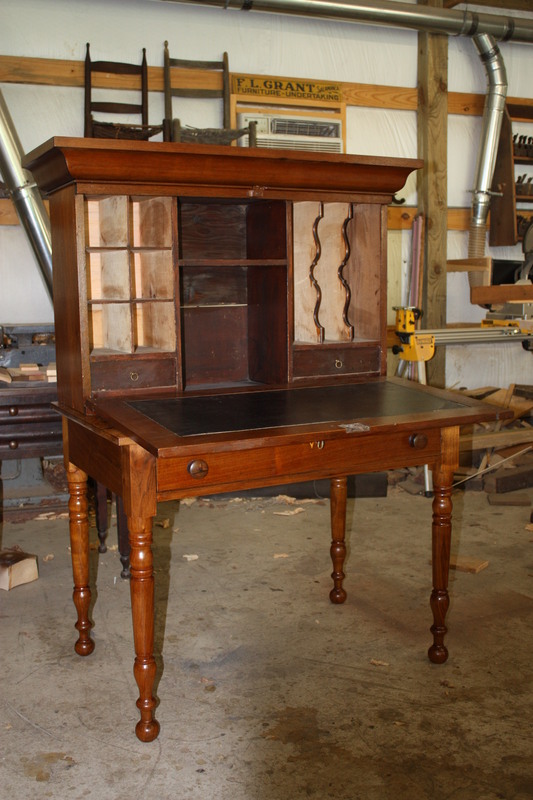 This entry was posted on April 13, 2011 by furniturewithhistory. It was filed under Plantation Desk and was tagged with cyma molding, document compartments, oil cloth, pigeon holes, plantation desk, turned legs.